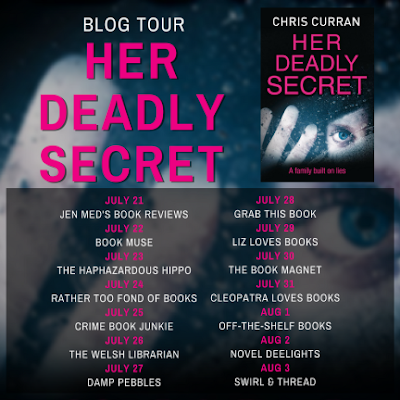 Her Deadly Secret is Chris Curran's latest novel, and it's a cracker of a read! When Lily goes missing her parents Hannah and Joe are naturally distraught. The Family liaison officer immediately notices something off with Hannah. Does she know more than she's letting on? Lily tragically is found murdered in woods near to the family home. The suspicion immediately falls to the parents, particularly as Hannah is still behaving oddly. Loretta, the family liaison officer assigned to the case knows that she is hiding something, but she seems so fragile that she can't bring herself to start questioning Hannah until the case has more investigative depth. Meanwhile Joe also thinks that his wife is behaving oddly, but puts her behaviour down to the tragic loss of their daughter. And then he discovers that Lily had a boyfriend, a member of the local religious 'cult'. Joe is familiar with the Children of Light only because he 'rescued' his wife from their clutches. The news that his daughter may gave become acquainted with them is not something he wishes to hear. That his daughter had a boyfriend he knew nothing about seems the least of his worries. He has always known that he wasn't Lily's natural father but that didn't seem important until now. The Police are suddenly very interested in the fact that he isn't Lily's natural father, but why is that? They can't possibly believe that he is a suspect. But if not him, then who? Her Deadly Secret is a novel full of questions, that will have you turning its pages, gripped, until you find the answers. 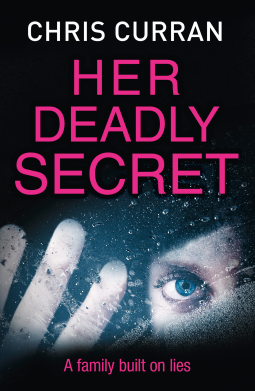 Her Deadly Secret is available now via Amazon online and all good book shops. Thank You to the author who allowed me to read an advance copy of this novel and invited me to take part in the blog tour in exchange for an honest review.